Buttercream Icing was the basis for a cake decorating lesson. Actually, it was my final exam in the cake decorating class I’ve been taking. We were to bake two layers, stack and frost them before class. We could make flowers ahead of time and let them dry. In class we had to write a word on the cake and do the border, then complete the cake. I knew right away I wanted Tiffany blue as the base with white decorations. We hadn’t had instructions on how to make the flowers I wanted to use, but I read the book and watched a couple of videos. And created them anyway! The meringue powder in the recipe helps the frosting form a firm crust that allows decorations to hold their shape. Still the larger flowers, the teacher said, would need about three days to dry enough to completely hold their shape while being set on the cake and transported. Meringue powder also allows the cake icing to crust just enough, creating a firmer base on which to build the decorations. I wanted to allow enough time for that to happen before class. I baked the cake Saturday. After it cooled, I leveled the layers by cutting off the rounded tops. A layer of frosting on the bottom one and I set the top one in place upside down. This let the 90 degree edge created by the cake pan form the top edge of the cake. Then I frosted with a “crumb coat” of icing – just enough to keep crumbs from breaking loose and ruining the look of the icing. (And, lesson learned, I didn’t bake a chocolate cake this time!) After several hours, I went back and gave the cake a thin coat of the Tiffany blue, partly to create a smooth base for the last layer and partly to “practice” the icing techniques. (I made an entire recipe of Tiffany blue to do the cake as teacher warned it is impossible to match the new batch to the old, should you run out!) Sunday morning, I put on the last layer of icing. I remember it turned out gorgeous, smooth with a sharp edge at the top. And then I reached up for something and bumped the cake, lifting off a four inch strip of frosting – and cake!- all along one edge. In class, we first had a lesson in ribbon roses and writing. Writing was by far the hardest thing ever! Teacher had me thin my icing – twice – which really helped. But my lines still curlicued, broke, twisted and refused to go where my brain shouted directions! And I was only doing a three letter word! After picking letters off several times with a toothpick (yes, you can do that! ), the last two finally came out okay. The “J” I finally let dry for a few minutes and then I shoved it into its real shape with a toothpick. I have profound respect for Niece who was a cake decorator in a store bakery!!!! And for sisters in law who have actually made wedding and other celebration cakes (plural) for other people! Excuse me. I have some a lot of practice to do!!! A frosting for cake decorating. Cream shortening, flavoring and water/milk until well mixed. Add confectioner’s sugar and meringue powder and mix at low speed until well mixed. Blend for an additional minute until creamy. Keeps a week in the refrigerator and freezes well. _Stiff consistency is used for decorations that will be upright, like roses. Medium consistency is used for stars, borders, and flat petalled flowers. Add 1 tsp of water or milk per cup of stiff icing. Thin consistency is used for icing, writing and making leaves. Add 2 tsp water or milk per cup of stiff icing. 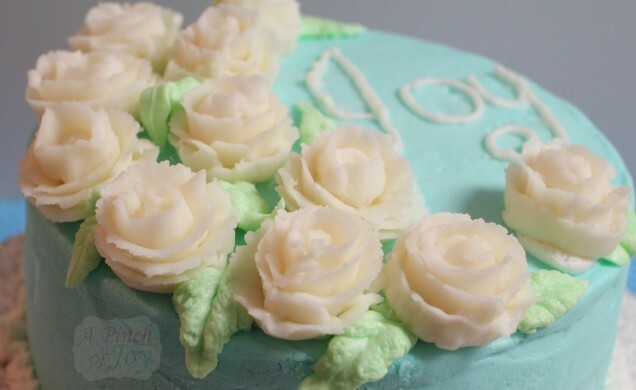 For writing, Wilton recommends that you also add ½ teaspoon of piping gel per cup of thin icing, to help the icing “stretch” and not break as you write. Frosted cakes will stay fresh in freezer up to six months. Defrost a frozen cake unwrapped to prevent condensation forming on the frosting and ruining it. Congratulations Charlene for being featured on this week’s Inspire Me Monday at Create With Joy! Thank you so much for sharing your awesome recipe with Full Plate Thursday. Hope you have a great week and come back soon! Congratulations on completing your class and for sharing such a fabulous project – you are featured on this week’s Inspire Me Monday at Create With Joy! Cake decorating is an art…your cake looks beautiful. Love the idea of the Tiffany blue. would have been using some choice four letter words while trying to spell out Joy. 😉 You an Dolly from Hibiscus House have both recently finished cake decorating classes. Y’all have given me the bug. Thanks for sharing at Show & Tell. Charlene, you did a wonderful job. I have always wanted to take a cake decorating class. My father was a talented cake decorator. He decorated our wedding cake 27 yrs ago! Great job! Thank you for stopping by Take Six! How cool that your father decorated your wedding cake! Thanks for coming by! Keep on creating, people seem to enjoy a gift cake as a thank you, thinking of you and get well soon “edible card”!! Thanks so much for stopping by and, especially, for the professional tips! You do a sensational job!